The relationship matrix diagram organizes data into sets of items to be compared. It also enables you to create, modify and delete relationships between elements with a single mouse click - another quick way to set up complex sets of element relationships with a minimum of effort. The relationship matrix diagram is a convenient method of visualizing relationships quickly and definitively. The relationship matrix diagram graphically shows relationships and allows a team or individual to systematically identify, analyze, and rate the presence and strength of relationships within a set of items or between two or more sets of information. Relationship matrix diagram provides a compact way of representing many-to-many relationships of varying strengths. Why Use Relationship Matrix Diagram? Many people may curious about why should we use relationship matrix diagram to show complex relationship. I am very honored to answer your questions. Because relationships between things are often complex (many-to-many) and require us to think in more than one-dimension. The relationship matrix diagram is a simple tool that allows relatively complex situations to be analyzed in a simple straightforward way. They help us to expose interactions and dependencies between things that help us to understand complex causal relationships. When comparing two lists, there is sometimes a simple one-to-one relationship which can be easily documented in a side-by-side table. However, when a single item from one list may be related to several items in the other list, then the side-by-side format does not work. 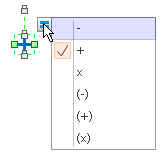 The relationship matrix diagram allows two lists to be compared by turning the second list on its side to form a matrix. Relationship in relationship matrix diagram between two items can now be indicated in the square or cell where the row and column of the two items cross. There are five basic types of relationship matrix diagrams that allow for different numbers of lists to be explored. L-type, T-type, Y-type, X-type, C-type, QFD type (Quality Function Deployment). Although it is convenient to use relationship matrix diagram to show relationship, drawing relationship matrix diagram by hand is kind of difficult. 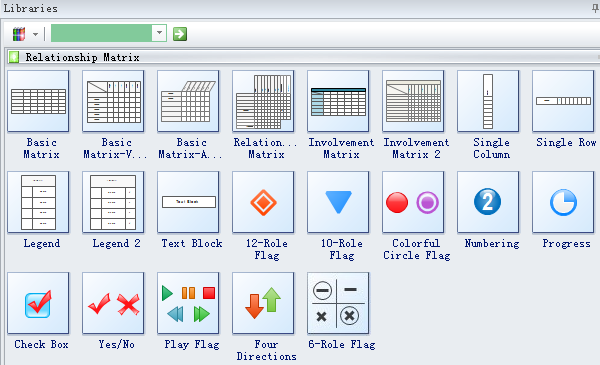 No worries, you can use relationship matrix diagram maker to draw it. Now let me show you how to make relationship matrix diagram step by step. 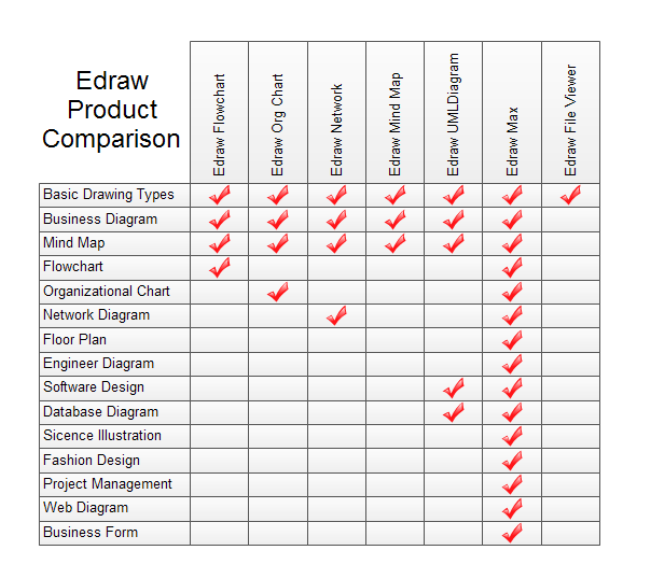 First things first, open Edraw Max, point to "File", then point to "New", find "Relationship Matrix" and click it. When you click the relationship matrix diagram templates, you may find that there are examples at the lower part of the software. Double click the example, then you will open it. You may customize and edit the example as you like, which will definitely save you plenty of time. Choose the relationship matrix shape you need in the library which is on the left of the canvas. 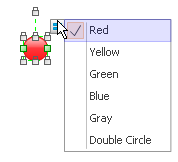 When you use the symbols "check box", you may find that there is a floating button on the upper right of the shape. From the floating button you have three options just as the picture below shows. Also, when you use colorful circle flag symbols, you may find that there are lots of color options on the floating button. When you use the numbering symbol, you may find the rotate arrow on the top of the symbol. Moreover, you may double click the shape to change the number just as the picture below shows. Last but not least, you should pay attention to the floating button of the four directions and 6-role flag symbols. You may also edit other relationship matrix diagram features to make it look more attractive. 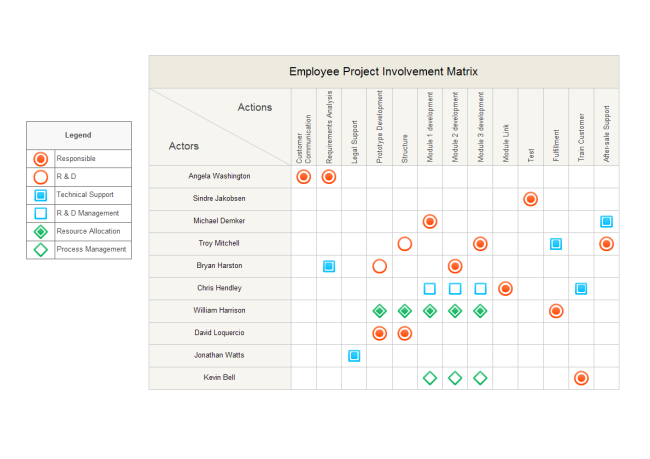 Check out more relationship matrix diagram examples to get ready-made templates. Learn more about how to create relationship matrix diagram before you start.